The former Barcelona FC legendary keeper, Victor Valdes, announced that he is close to making his return from injury after seven months on the sidelines. Valdes was spotted in the stands at Old Trafford surrounded with Manchester United players during their 1-1 draw with Chelsea couple of weeks ago. Turns out that Valdes, who is a free agent since this summer, has been training with United for the past month during the final stage of his recovery. Victor Valdes had not posted on social media since April, but did tweet the following yesterday: "Great training session Today. Almost Ready! Thanks for your supportive messages throughout these months. They have helped me a lot!" Valdes spent twelve years at Barcelona where he appeared in 535 games and won three European Cups, among countless other trophies. He announced prior to his injury that he would not be renewing his Barca contract as he wished to play in a different league and experience different things. Valdes then tore his ACL in March of 2014. Manchester United are still working on renewing the contract with their number one keeper, David de Gea, which expires in the summer of 2016. Their substitute goalies currently are Anders Lindegaard and Ben Amos. We will soon find out where the 32 year-old Victor Valdes will end up. The odds are that Valdes will sign for United. Some people are saying that Valdes would be better off going to some place like Liverpool, where he could be the number one keeper vs. having to battle for the spot with David de Gea, who is in amazing form at United this year. 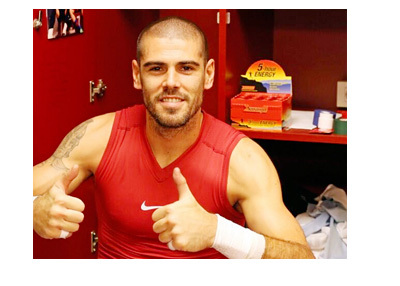 It is good to have Victor Valdes back in the mix!